Just a quick note this time: Ignite UX Michigan is coming back! Planning has gotten underway for this year’s event, and this year looks like it’ll be our best organized year yet. Which isn’t that hard to manage, since this is only the third year. Last year was a valuable experience in breaking off pieces of the work and trusting it to other people. Not that we were hesitant to do so—it was more the case that in the first year, we just didn’t know exactly what the work would be shaped like. This year, we’ve got more volunteers, and I think part of the challenge will be keeping things organized and keeping everybody engaged with as much stuff as they want to do. Oh, and the event will be in September this time. That’s because starting in 2016, we’re going to permanently move to the Winter semester. This entry was posted in UX Profession on April 30, 2015 by admin. 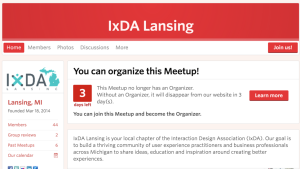 It looks like IxDA Lansing is in trouble. Their web presence was diffuse, so it’s hard to track down the authoritative place for information, but it looks like their page on the IxDA website hasn’t been updated in a long time, their own domain name has expired, their Twitter account is highly inactive, and their Meetup group no longer has an organizer. This is a shame, because even when Michigan’s state-wide UX organizations were a lot more active, they never served Lansing (and Grand Rapids) as well as Metro Detroit and the Ypsilanti area. It’s good to have a way for local professionals to meet up on a regular basis, although the downside of a proliferation of groups is that the few people that will volunteer time get spread more and more thinly (like butter over too much bread). 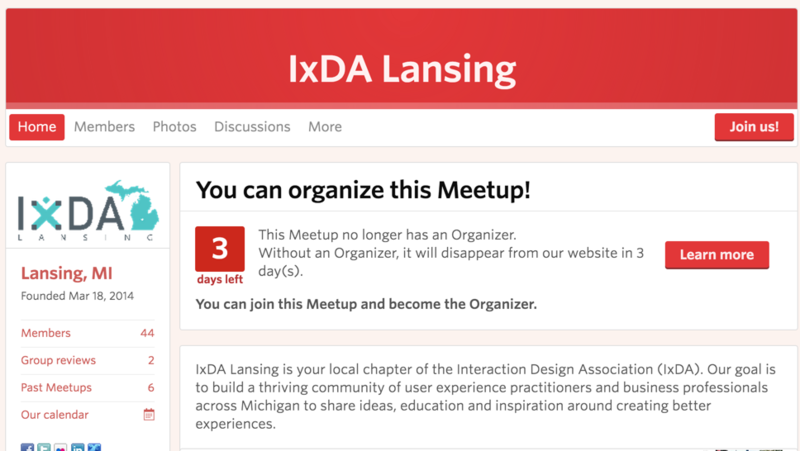 I can see (what looks like) IxDA Lansing shutting down as part of a pretty broad trend away from organized professional groups in our field. We have a lot of alternatives for professional development, and a lot of ways to stay in touch with other people in the field. And asking people to do stuff after work, in their free time, to further their career is a hard thing to ask (and kind of exploitative, but that’s just the nature of the system we live in). IxDA Lansing, it was good to have you around. This entry was posted in UX Profession on April 23, 2015 by admin. After conducted several interviews for my history project, I decided to focus for the time being on (roughly) 1990-2005. The more I learned, the more interesting this time period looked from the perspective of the professionalization of user experience. To start with the obvious: There was no “user experience” field in 1990. That didn’t come until much later. At the start of the 90s, there was an academic field called human-computer interaction, made out of computer science and cognitive psychology. There were some practicing professionals, and they stayed in the orbit of the academics and took what knowledge they could glean from them. During the 90s, the world wide web as we know it took off, starting with the invention of the Mosaic web browser in 1993. In the next few years, web design became a profession and exploded, figuratively speaking. In this context, Southeast Michigan saw the founding of some historically important design agencies, and the invention of librarian-style information architecture. Meanwhile, more and more people came into the growing usability profession by way of other fields like technical communication, visual design, and more. The growing community of practitioners wanted ways to develop their skills, so we saw the founding of MOCHI at the newly re-organized University of Michigan School of Information. However, this organization had an academic focus, leading a few years later to the founding of the local chapter of the UPA (an echo of what happened at the national/international level, where the UPA was founded to serve the needs of new set of professionals). So, yeah. An interesting time period. Before 1990, there were people in Southeast Michigan involved in the academic HCI scene and, of course, people working in human factors (although they seemed to not have formed a strong community). After 2005, the number of UX professionals kept growing, and the ways those people learned and formed communities changed a lot, getting away from the model of having few, large, centralized organizations. Those are time periods I want to dig into further, but for the time being, I want to flesh out my knowledge of those 15 years. This entry was posted in UX History on April 16, 2015 by admin. As time goes by, I get more and more interested in how to design for entire experiences beyond a computer screen. A place like Disney World, for example, invests a lot of time and energy to ensure that little is left to chance in the experience of visiting their theme park. Similarly, architecture is fascinating to me because our buildings are, in a way, a huge interface for us to interact with. Recently, I stayed at a motel. It was run down and kind of terrifying, like an ecommerce site that didn’t quite work right and looked like it was 10 years old. It offered a lot of amenities, but those amenities weren’t quite right. My favorite were the refrigerator and microwave. Having these things in a hotel room is awesome. You get to bring food with you on the road, save it, save your leftovers, eat them later. It’s great for thrift and for not wasting food. Both of these devices were plugged into an outlet controlled by the lightswitch. That is, when you enter the room and turn on the light, the refrigerator comes on and the microwave starts beeping because it wants you to set the time. So, you get a great choice if you want to keep that refrigerator running: You can sleep with the light on, or you can get a ladder and unscrew the light bulb in the light, or you can push around the refrigerator and plug it in somewhere else. All of these choices are great. I’m sure the logic behind this decision was to save power. If no one is in the room, why run those appliances? But it lead to this weird problem as a user of the room. This entry was posted in Product Design on April 9, 2015 by admin. Recently, Spotify released a new version of their OS X desktop app. It is prettier than the last version, but in ways that I have a hard time articulating. I think that they went over the fine details and made things like contextual menus look better, as far as font as spacing goes. If it had just been a facelift, I could have gotten on board with it, but, wow, this is a company that is aggressively testing how far a valuable service will get you. Their queue functionality has long been problematic, due to a model that baldly makes no sense. You can click “play” on the first track of an album to queue up the whole album. If you then pick another album and “queue” it, it will insert every track of that album after the currently playing song, thus splitting up whatever album you happened to be listening to. You also can’t remove items from your queue once they’re there, without clicking “play” on another whole song. This instantly clears out your queue. This is less user-unfriendliness and more like outright belligerence toward users. Meanwhile, they hid the queue; instead of putting it in the nav menu on the left, it’s buried in the bottom of the screen as an inscrutable icon. Very close to the volume bar, which has lost its affordance and instead just looks like a decorative horizontal bar until you hover over it. (Although, truth be told, I’m curious how far context and relying upon an idiom that users may have actually learned will work out for this particular design choice). Fundamentally, it just doesn’t feel like Spotify gets the concept of albums. Not just with regard to queues – managing albums is atrocious if you want to collect a large set, and the way that singles – actual, single songs rather than EPs – are treated as independent albums is bizarre. It’s clear that they weren’t thinking about how to handle albums until the beginning of 2014. This entry was posted in Product Design on April 2, 2015 by admin.